Everyone knows the story of the three little pigs, but now you're going to meet the three little javelinas (pronounced ha-ve-LEE-nas)-loveable, wild, southwestern cousins of pigs. Living in homes built out of tumbleweeds and saguaro ribs (from the fallen giant cacti), the first two javelinas are soon running from the hungry coyote, who had hoped to eat them with red chile sauce. And where do they go for shelter? Why, to their wise sister's house, made strong with adobe bricks. This clever and humorous tale is sure to delight children of all ages, especially those familiar with the Southwest. Dressed in cowboy duds and prepared for life in the rugged desert, these characters are more than any coyote bargained for. 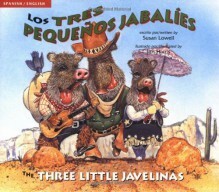 The Three Little Javalinas is a great book to use in the classroom to keep the attention of your ELL students. You could use this book and the original Three Little Pigs book when doing compare and contrast. I would say this should be used in the 3rd to 5th grade classroom.